Minister for Defence, the Hon Christopher Pyne MP, and Minister for Defence Industry, the Hon Steven Ciobo MP, today welcomed the opening of the inaugural AIR4 event which aims to encourage young women to see the value in pursuing science, technology, engineering and mathematics (STEM) studies. More than 1,400 female students and 80 teachers participated in various interactive activities at Melbourne's iconic Luna Park, including learning about driverless cars and experiencing HoloLens firsthand. Minister Pyne said the interactive activities offered students the opportunity to have fun with rides and attractions while exploring the possibilities of STEM-related fields. "Women represent only 16 per cent of STEM graduates across Australia. In order for Defence, and indeed the country, to get the very best capability, we need to have greater female participation in STEM subjects," Minister Pyne said. "We may have the next aerospace inventor, satellite engineer, or a future fast jet pilot at the AIR4 event. For these girls, we see their future as limitless, and we would like them to see it that way too." Minister Ciobo said activities like AIR4 offered students the opportunity to better understand how STEM subjects can be applicable across all professions and industries. "It's great the students got to engage in exhibitions such as the Augmented and Virtual Reality, where participants could fly or watch a pre-recorded flight, wear protective equipment and helmets used by Defence personnel every day and test new wireless sensing systems," Minister Ciobo said. Students also had the opportunity to attend a special screening at St Kilda's Palais Theatre, of Jasper, a cutting-edge animation made in partnership with the Royal Australian Air Force and the University of Technology Sydney. Jasper was made to spark interest in aviation and developed using both traditional techniques and new technologies such as robotics and 3D printing. 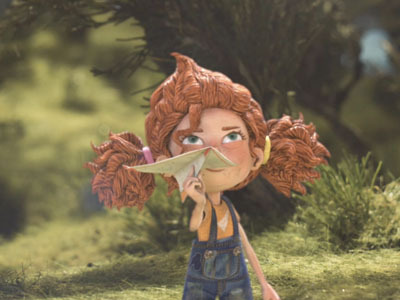 The film was recently awarded Gold at the prestigious 2018 Animation Effect Awards and Festival. Jasper's character is based on Squadron Leader Jacqueline Killian, who voiced the main character and will share her personal story and career achievements at the event. DST is a proud sponsor of the AIR4 initiative.